Looking for Home audio installation in New Jersey? You can’t have a home theater without great sound. Future Home Technologies can help you choose the right home audio equipment and do the wiring. Surround sound creates a wonderful listening environment for both the action of TV and movies as well as listening to music. Over the years, TV manufacturers have reduced the quality of their speakers in the TV. They sound pretty “tinny”. By adding a surround sound receiver and speakers, the sound quality is so much better and you feel you are part of the TV show or movie. When you listen to music, the music comes out of all the speakers so you are immersed in sound. The first step to having a great home audio system is getting surround sound system in your main TV area. For surround sound you need a minimum of five speakers and a subwoofer, all wired to a surround sound receiver. This is called 5.1 surround sound. If you have room for two more speakers on the sides, the set-up is termed 7.1 surround sound. Speakers in these home sound systems can be regular box or tower speakers, but in-wall or in-ceiling speakers are extremely popular. These speakers are flush in the wall or ceiling and can be painted over so they are not noticeable. Home audio speakers vary widely in price. You can spend a couple of hundred dollars for speakers that come as a complete set (home theater in a box) to thousands of dollars for high-end speakers. We advise customers that there is an entry price point for good speakers. After that, price is based on the subtlety and quality of the sound. It may be the difference between a $60 or $80 bottle of wine. At a certain point, many people are unable to tell the difference in quality. While having a matched home audio speaker set isn’t critical, it is important to get speakers from the same brand. All speaker manufacturers build their speakers to work together. We can get almost any speaker for your home theater needs, but Speakercraft or Paradigm are a great starting point. For receivers, Denon and Yamaha are great. Again, we support most brands and we get you the best in class and highest rated equipment. We can wire for speakers throughout your home or use wireless speakers so you have music wherever you go. Music can come from your PC, iPod or phone, or you can access all the music on the internet. You can use your smartphone or iPad to easily choose whatever music you want to listen to. Call Future Home for your outdoor spaces too. We can install outdoor speakers that are hidden or offer you wireless solutions for on your deck or by your pool. Speakercraft and Paradigm are industry leaders in custom audio speakers. Their speakers are sold by the highest percentage of custom installers in the United States. Besides amazing quality, they are known for a wide variety of speaker types and sizes to meet any installation job. They make a wide variety in-wall and in-ceiling speakers, subwoofers, outdoor speakers, box and tower speakers, along with supporting electronics such as speaker selectors, I/R kits and whole house audio. In many new houses or renovations, we’ll use in-ceiling speakers in both the family room and other rooms around the house. The advantage of in-ceiling speakers is that they are flush to the ceiling and are barely noticeable. The sound quality is great and you can feel the music surround you. It also makes designing and decorating a room easier because you don’t have to place box speakers around the room. For home theaters, there are a variety of speakers to fit any budget. Contact us for all of your home audio and home audio installation needs. Thanks elves at Future Home Technologies. You rock – and now we can, too!! 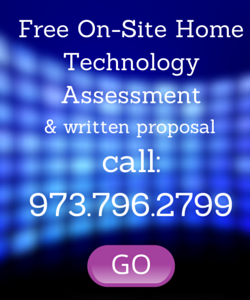 The guys at Future Home evaluate your home for what new technologies are available. They then make recommendations for specific media equipment. The guys provide many options and will take care of purchasing and installation at reasonable prices. Future Home is easy to work with. They did a great job for our home and for one of my clients as well. You did a great job for us! My wife and I would be happy to “like” you and I would also be happy to serve as a referral on occasion if needed.